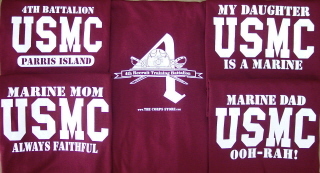 4th Battalion Parris Island T-shirt has the battalion logo on the back. The family t-shirts also have the battalion logo on the back. Select from: My Daughter is a Marine, My Step Daughter is a Marine, Marine Mom, Marine Dad, My Granddaughter is a Marine, My Sister is a Marine, My Niece is a Marine, My Girlfriend is a Marine, My Friend is a Marine and My Cousin is a Marine. AVAILABLE ONLY AT THE CORPS STORE!!! !